Urban & easy living at Muirfield, a gated enclave of 63 town-homes located within popular University Pkwy corridor. Walkability of this newer construction two bed, two & half bath town-home is incredible! Walk to Whole Foods, pick up a coffee at Wawa, enjoy dinner at Zoe's kitchen, or choose from a plethora of options @ UTC Mall. You can also get your exercise in at the beautiful world-renowned Nathan Benderson Park. Inside you will be greeted with an open, modern, and functional floor plan with rich espresso hard wood floors, designer light fixtures, crown molding, and a custom built in entertainment center in the living room. Kitchen features granite countertops, stainless steel appliances, and trendy open shelving providing extra storage. Upstairs between the master and guest bedrooms there is an open bonus/den area that can be used as an office or extra living space. The master bathroom has large shower & uniquely beautiful granite double sink. Laundry is conveniently located upstairs near bedrooms. Home is highly efficient, includes 100% Energy Star Certified Property rating, radiant barrier, R-38 insulation & low E double pane insulated windows. For added sense of peace hurricane shutters and alarm included and no flood insurance is required. Muirfield is also dog friendly with no size limit & has very low monthly fees, water included! 15 minutes to downtown Sarasota. Own for less than the cost of rent OR Rent w/option to purchase through Home Partners of America. 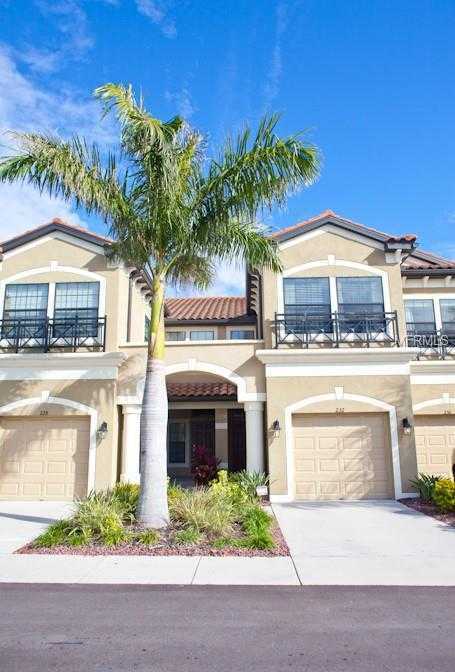 Please, send me more information on this property: MLS# A4431812 – $245,000 – 232 Crew Ct, Sarasota, FL 34243.